Let’s get the bad news out of the way first: yes, it’s that time of year already and yes, you’re going to have to start buying presents soon. Right, now to business: Hooray! It’s Christmas (nearly)! The festive period is a time of joy, merriment and more DVDs than you can shake a stripy candy cane at. There’s a Santa’s sack full of quality movies coming out over the next couple of months, with something for just about everyone. Like the busy elves we are, we looked through the release schedules, picked out the best of the bunch and served them to you in a handy little gift guide. This weepie about an against-the-odds relationship between two teenagers set box offices – and the hearts of teenyboppers everywhere – alight earlier this year, and is set to take its place alongside PS I Love You and The Notebook in the ‘movies I only watch if I want to bawl my eyes’ out section of DVD collections across the globe. Perfect for: the lovelorn teenage girl in your life. The second part of Peter Jackson’s second (not quite as good) epic Middle Earth trilogy sees Sherlock co-stars Martin Freeman (Bilbo) and Benedict Cumberbatch (Smaug, a big dragon) face off for control of Erebor. There’s dwarves and Gandalf too, of course. Perfect for: the hobbit-loving Tolkien addict in your life (check they haven’t already bought it first, though). Anything The Avengers can do, the X-Men can do better (depending on who you ask). Following the current trend for epic superhero team movies, Days of Future Past sees characters from across the series (including old-and-young versions of Professor X and Magneto and old hairy chops himself, Wolverine) unite to take down a world-threatening evil. Toothless, the cutest dragon ever, and Hiccup return for more adventures. This time, the two discover an ancient ice cave that houses hundreds of dragons and a mysterious Dragon Rider. Like the first movie, How to Train Your Dragon 2 has enough action to the keep adults entertained, while kids will love Toothless. Perfect for: the whole family (apart from the moody teenager who’d rather sit upstairs and listen to Cradle of Filth)! You know the drill here: big robots, bigger explosions and the occasional ridiculous plotline. It’s the Transformers we know and love. There is one major change though: Shia LeBeouf is out, replaced by the altogether more masculine Mark Wahlberg. He still doesn’t get to do much while the Autobots and Decepticons duke it out, mind. Perfect for: the adrenaline freak in your family. Testing out the brand new surround sound system you bought yourself for Christmas. After going undercover at a high school, unlikely cop duo Channing Tatum and Jonah Hill are off to college! Although they’re supposed to be solving a crime, the two end up in very different cliques and begin to question their own partnership, and what it means to be a grown man. Oh, and there’s loads of naughty jokes too. Perfect for: the overgrown man child in your life. Aspiring undercover police officers. Who’d have thought that a movie about a group of intergalactic crime fighters – including a talking raccoon and a tree voiced by Vin Diesel – would end up being the year’s biggest movie? Then again, it is a Marvel movie, and just about anything they touch at the moment turns to gold. 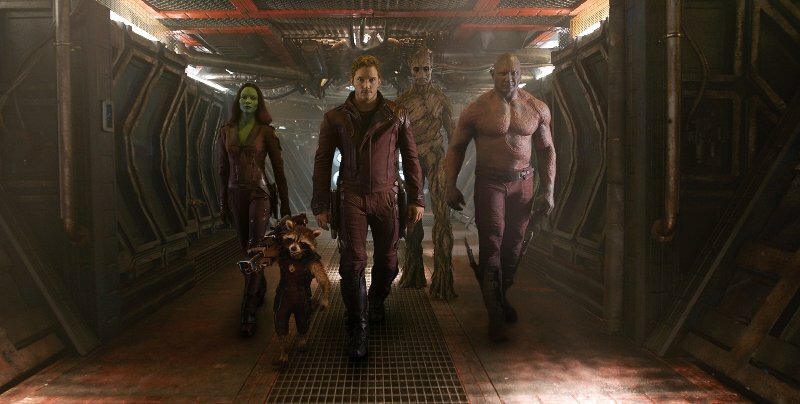 Guardians of the Galaxy is a ridiculously fun movie; imagine the Avengers, but a bit sillier, a bit more space-y and with 100% more Motown. Perfect for: Everyone. It’s that good a movie. Dawn of the Planet of the Apes is the second prequel to the original Planet of the Apes, although we’re bound to get a new version of that soon, so it’s actually a prequel to a film that hasn’t come out yet. Confused? Yeah, us too. Anyway, all you need to know is that this is a surprisingly great film. After being raised by Dr. James Franco, Cesar lives a happy existence in the forest with his ape friends. Unfortunately, humanity isn’t faring quite as well. They’ve contracted some horrible virus from apes which has wiped out 90% of the population. The remaining 10% scrabble around for food and have parties whenever they get a bit of energy. Sure enough, the two worlds soon collide and we edge a step closer to Charlton Heston screaming at a half-buried Statue of Liberty. Perfect for: Monkey fans. Tim Burton (actually, on second thoughts…). You knew this was coming, didn’t you? Even though it’s already out on DVD, Disney have decided to release a new singalong edition of Frozen. Not only will you be able to listen to all of the songs again, but you can sing along to them too! Perfect for: Kids. Parents with exceptional levels of patience for Let It Go. Fresh from conquering Magaluf with their unique ‘charm’, the lads head off to Australia to meet Jay, who claims he’s living the lifestyle of a superstar DJ. He isn’t, of course, which leads to a series of unfortunate – and extremely cringeworthy – events. It’s not quite as funny as the series or the previous film, but it should raise a few chuckles round the Christmas tree. Perfect for: anyone over the age of 13. Best put the kids to bed first if you want to avoid any awkward questions, though. If you’re planning to treat a loved one to any of the DVDs in this post (or treat yourself! ), why not have a DVD declutter first? Click here for some top tips, and click here to start selling!